Panini once again releases Rookie Anthology - a product that brings together and updates many of Panini's brands. This yearly release has been very popular amongst collectors as it has provided great looking cards at a collector-friendly price. I personally have been quite middling when it comes to Rookie Anthology, but I definitely see the value and appeal that the product has had. Although I usually think of Rookie Anthology as a product mash-up, it does have its own product specific design that has stayed pretty consistent since its beginnings. 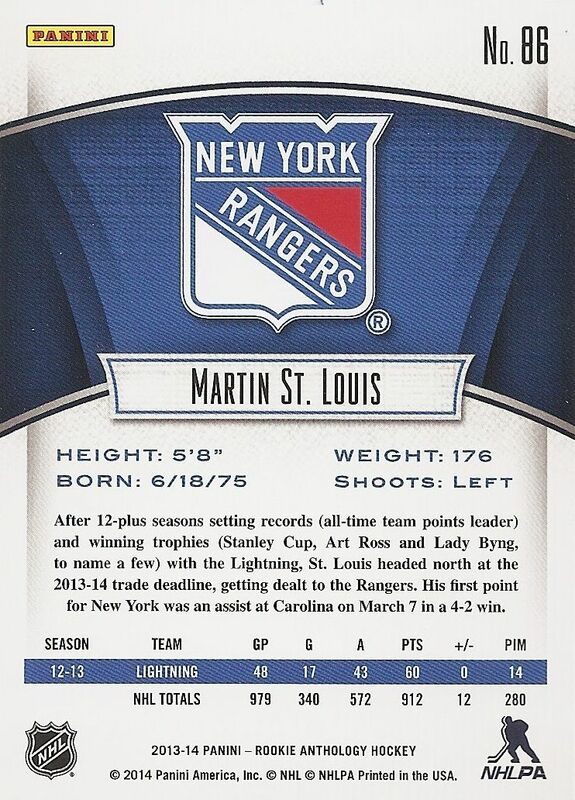 The Rookie Anthology base cards have always had a a white background with the player's team colors used as highlights. Silver foil has also been used to add a bit of shimmer. 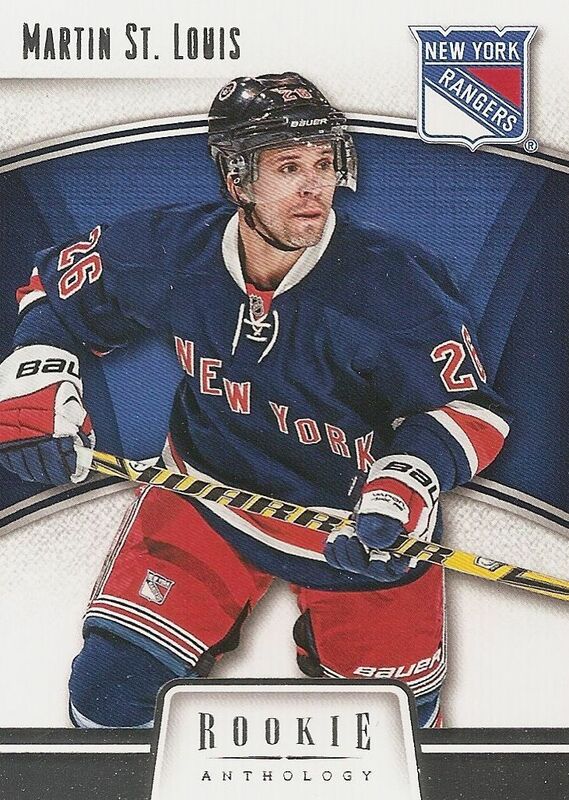 The cards look good - they are bright with a large, bold photo of the player on the front. The cards are a bit on the thinner side, so they don't have that premium feel when you hold them in your hand, but that's ok given the price of the product. The card back is the standard Panini affair. There is, sadly, no picture on the back, just graphics and a team logo. At least the bold colors of the front are present here though, and there is a nice write-up of the player for collectors to read and take a look at. Dual Rookie Jersey autographed cards have been the norm for the Rookie Anthology rookie cards. These cards have always looked great, and that continues this year as well. The design of these cards have a super-premium quality about them. I feel like these rookie cards could have been in a product that costs more than Rookie Anthology. Panini has always done a fabulous job with these cards. The cards have been serial numbered to 249, but rarer prime, patch, and tag versions exist as well. Collectors will find Rookie Anthology boxes filled with a variety of fun and surprising hits. You can expect to get 4-5 hits per box. Brands like Luxury Suite, Prizm, Score, Select, Titanium, Crown Royale, and Dominion have not-so-subtly snuck there way in. Besides the dual memorabilia rookie cards, there are no other Rookie Anthology specific insert sets or hits. Instead, you'll find updated base cards from sets like Score filling up packs. 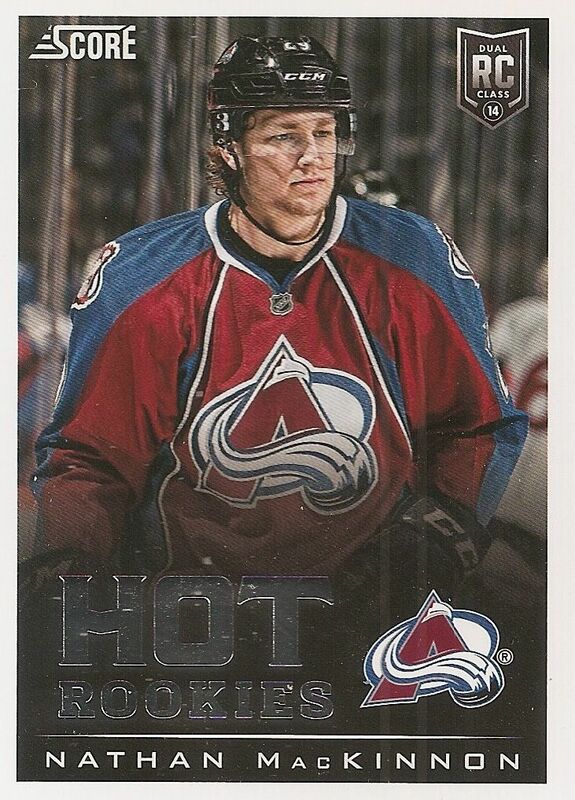 This Nathan Mackinnon Hot Rookie card was a nice one to pull out. Though I was pretty happy to get this card, if I were a Score collector, I'm not sure how happy I would be having to acquire Score cards out of Anthology to complete the set. On one had it's great that the initial set can get some more life, but on the other hand, Anthology is a much more expensive product. It could be out of reach for some collectors on a budget out there. Prizm base and parallels can also be found within Rookie Anthology. Like with Score, it can be neat to get a hold of some of these updated cards, but it can be a hassle too. Collectors what re-visit 13/14 hockey products may be confused where they can find these parts of the set. Insert sets containing hits are also found in Rookie Anthology. 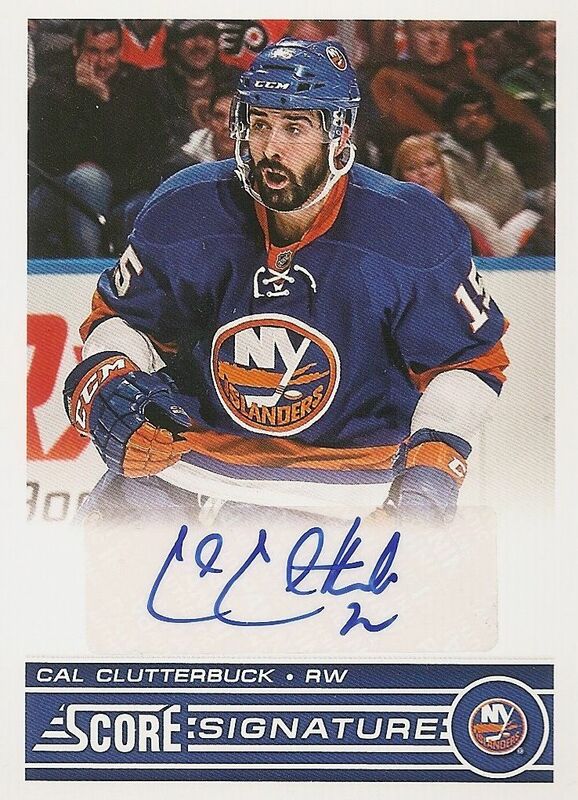 This Cal Clutterbuck autograph card would have initially been found in Score, but it shows up here instead. 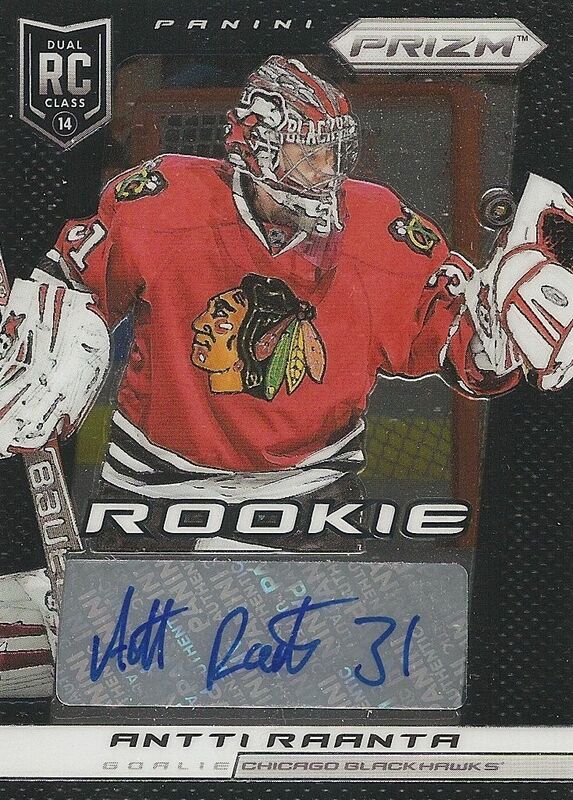 This Antti Raanta autographed card comes from Prizm. 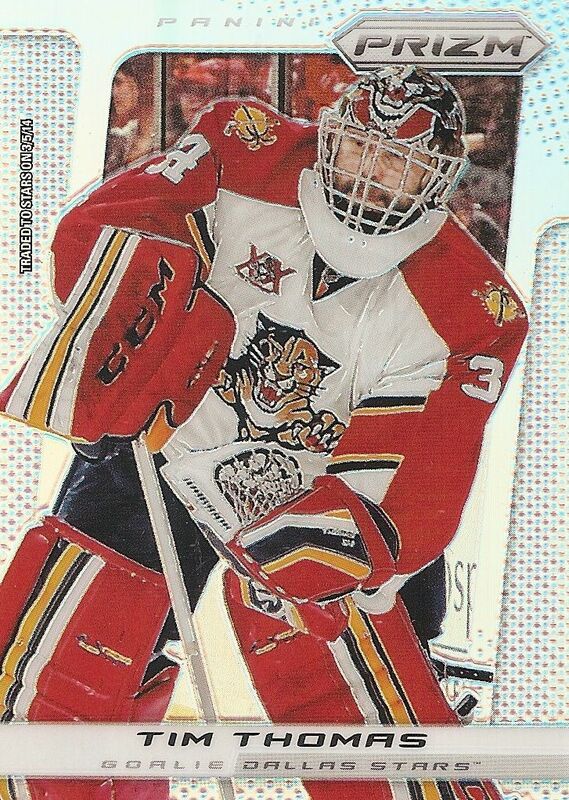 I don't remember if the rookie cards had such a dark colored foil on it - at first I thought it may have been a one-of-one. It's a nice looking card and a nice find in my box of Anthology. 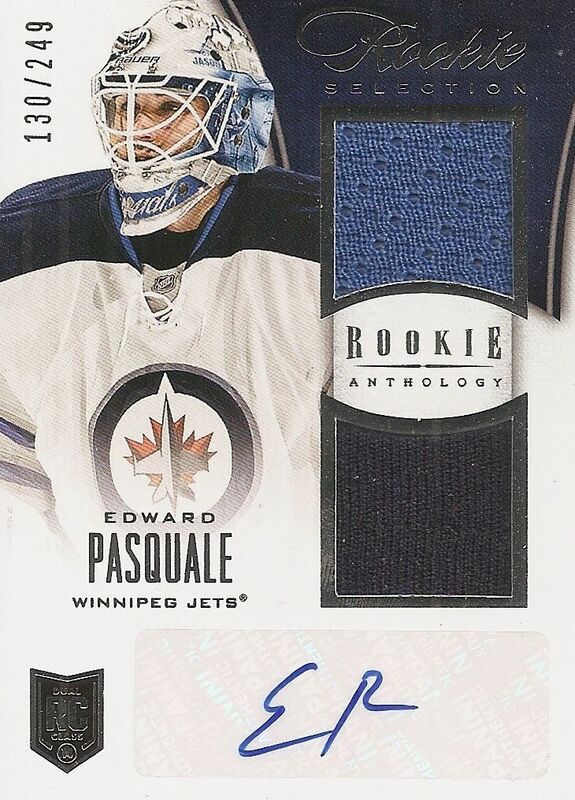 Popular jersey numbered rookie cards from Titanium are also in the mix when it comes to Rookie Anthology. 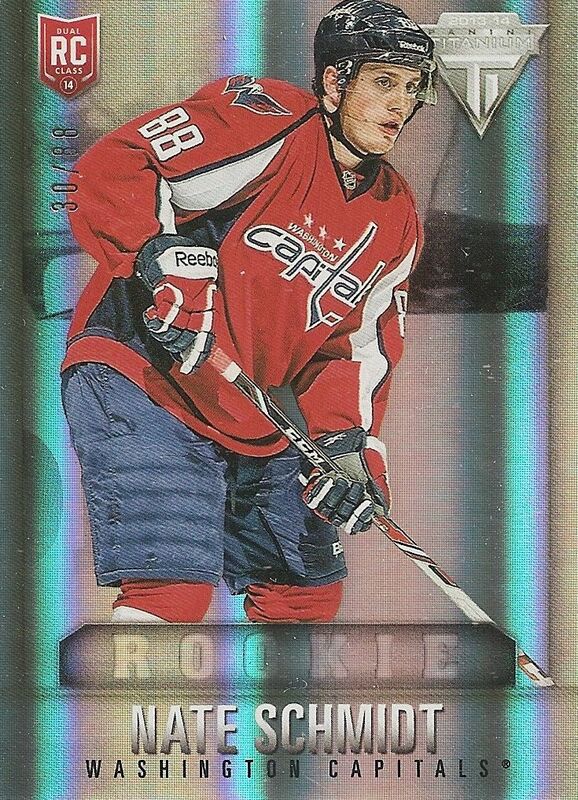 The Titanium rookie cards have been some of the most valuable of all rookie card types to get. It's pretty sweet to have a chance at getting some with Rookie Anthology. To really take things up a notch Panini has inserted Dominion cards into Anthology as well. Dominion was released pretty early this year, and now we get a chance to revisit it. I was pretty happy to pull this Emerald fight strap memorabilia card. It was certainly a surprise! Even more impressive than the fight strap card was this Seth Jones autographed patch card - also from Dominion. The patch on the card is pretty amazing - and the on-card autograph is equally great. Seth Jones is a very promising young defensemen, and I hope he is able to live up to his hype and potential. I was extremely pleased with the box I got. The two Dominion cards really were something else! These were great cards, but there is much more to find in Rookie Anthology. Lucky collectors can even pull the Silhouette cards from Crown Royale out. It looks to me that Panini has really loaded up Rookie Anthology for us. Panini has really outdone themselves with this year's Rookie Anthology. It might be because they know that there will be no new hockey products out from them next year. I really don't know... but whatever the case may be, Rookie Anthology looks to be a very loaded product this year. The designs are great, and the chance to pull amazing cards from many different Panini brands is an opportunity you shouldn't pass up if you can afford it. Boxes of Anthology run for around $100. It's a great deal for a product that can deliver such an amazing variety of hits. WOW PRODUCT!! 11/10 for this year's R.A.! Jam packed with wholesome Panini Goodness! Wow, what a great box! If that gets a 9/10, what gets a 10/10? 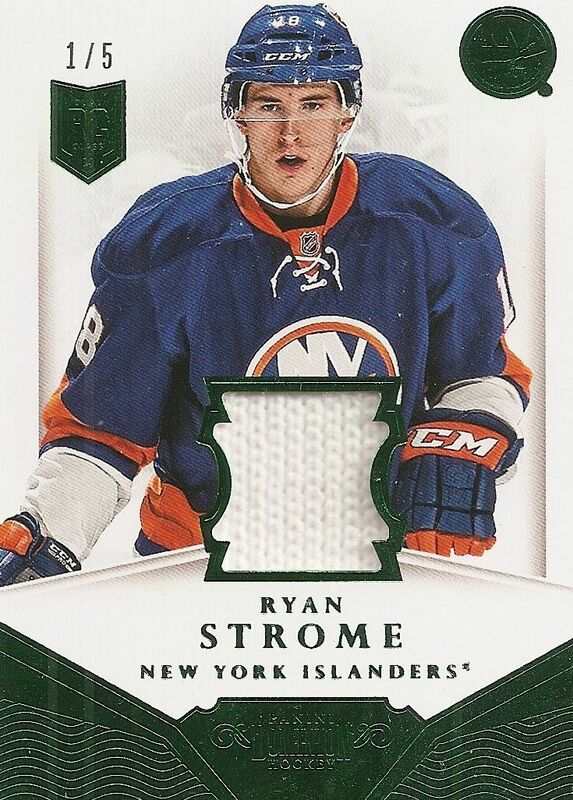 Great box and sick Strome! Wow amazing product, Deam your lucky man :) Really good box, That Seth Jones is one heck of a hit! That was an amazing box with 2 dominions. I think this is the best year of rookie anthology so far. Personally I don't like that they put Score in the mix. Besides that, exciting product. Thanks for an another great review. This product looks way better than past because of all of the great rookies this year on top of the awesome patches and autos. I really like the base card design and that Seth Jones you pulled is sick! You had a pretty loaded box! great box, seems the same every year, not bad to have the first card be mackinnon either. rookie anthology is always like a flashback of the year to me. Awesome product! Nice Pasquale, Strome, and Jones! + The chance of pulling some really high-end cards from for example Dominion, a patch/tag version of the Nathan MacKinnon Rookie Selection card etc. - The base card design doesn't please my eyes at all, especially not the backs. But fortunately, this product is about the cards from other products. Wasn't a really big fan of rookie anthology, but with this years product 13-14 out I would have to say it is one of my favourite products out this year. Love the addition of dominion cards. Love this stuff. Great prouct, a lot of solid hits in each box. Every box is fully loaded. This is one of the best products this year in my opinion due to the different hits of all the other panini products. Thanks for the contest blacksheep! Buying this soon! 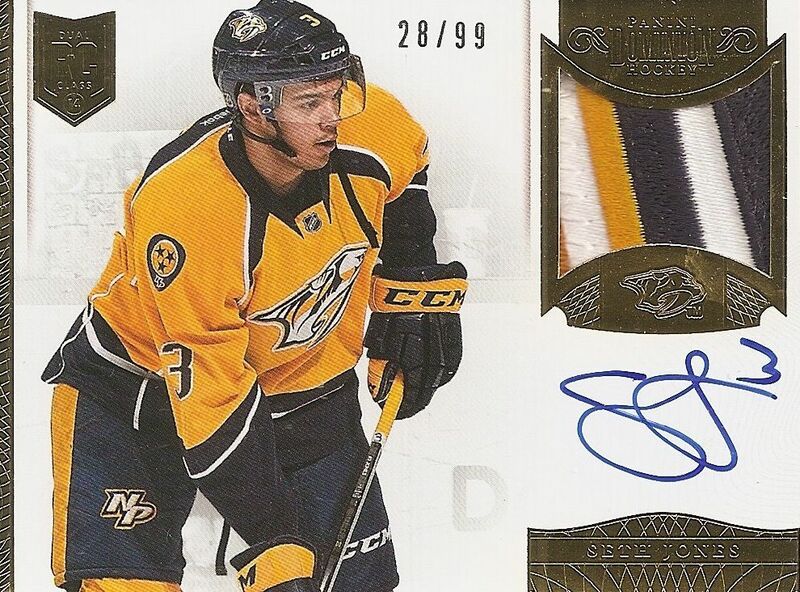 Love the on card auto of Seth Jones. It's nice to see Preds starting to get a few hits in these.